If pressed to give an answer to the question "what is your favorite year?" 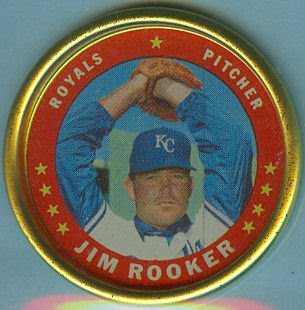 1971 would be near the top of my list both personally and in terms of Topps' aesthetics. 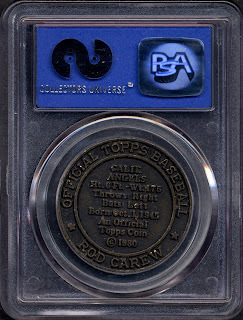 The regular issue cards with their black borders and modern fonts look great and there were a couple of fabulous interactive inserts to herald the end of the "extra" era, including the hugely popular baseball coins which are the subject of today's post. 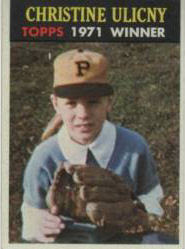 In some ways 1971 was the end of a Topps marketing era, a subject that will be examined here some day. 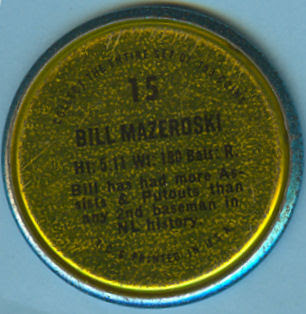 The coins were stamped from thin aluminum that was dyed front and back in different colors and then had a small circular border and photo added to the fronts and some brief text and vitals to the backs before the rims were rolled. 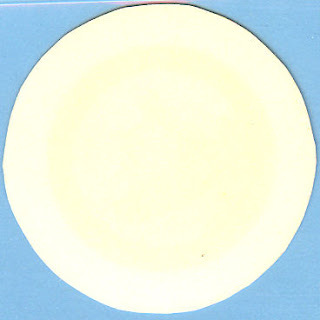 They were then inserted, one per pack, into ten cent wax product and hit the streets. If you were a kid in the summer of '71 you will never forget the distinctive sound these made in your pockets; not quite a "clink" and not really a "clank" but right in an acoustic sweet spot all their own. They also have slowly revealed patterns to their production. 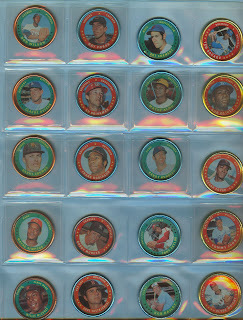 I am in a little bit of awe over the design and layout of the coins, as well as how Topps generally produced some other sets that do not display obvious patterns on their proof or production sheets but follow a strict order when regrouped numerically. Other quirks in the set seem to be production related as the second tranche of 51 coins seems to have grainier photos and the last tranche has centering issues in my experience. 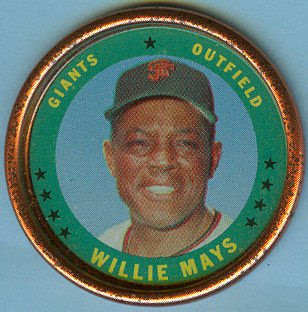 And there is one more NL player than AL, appropriately it is Willie Mays at #153, nearing the end of a glorious run as was Topps with their golden age inserts. I like the vintage Bucco's cap! I suspect this and the fact her favorite NL team is the Pirates places us in Pennsylvania again and although the back of the card states Grosston Public as her school, I don't get a hit in Google. It's likely been renamed after all these years. Well your blogmaster is off for some hard-fought rest from the real world for the next couple of weeks. 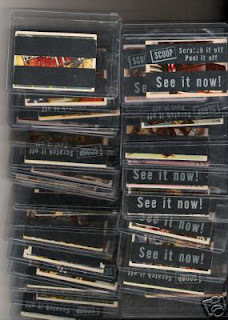 Fear not though, Topps-heads, all sorts of goodies are planned for the south side of the All Star Break. Until then, take a gander at this production still from Topps' Duryea plant, which makes me exhausted just looking at it! 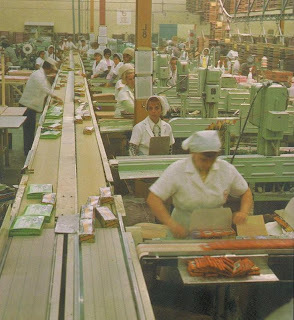 Those are 1974 baseball cards hot off the presses-cello retail boxes on the left, wax boxes on the right (I originally though the latter were factory sets but can't find a reference at the moment positively identifying the factory set graphics). 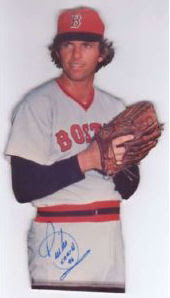 The 74's were the first set of cards that could be bought all at once in complete form (all 660!) and they were housed in a nice, Topps-produced box to boot. The boxed sets were sold through Sears and probably a few other big retailers of the day. I'll try to score a scan of the factory box down the road. Just The (True) Facts Ma'am! 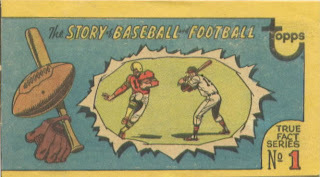 I was a bit neglectful earlier this week and did not post two key scans of the interior of the True Fact Mini Comics, which would have shown why the booklet has appeal to sports collectors. 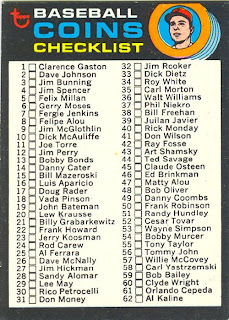 I finally found my reference for this issue (hiding in plain sight in Chris Benjamin's Price Guide to the Non Sports Cards No.4, albeit out of strict alphabetical order). The baseball section is chock-a-block with Hall of Famers-yikes! Click on each image for a better view!Who was Pudge Heffelfinger, you ask? Well, he was an important early college coach. There could be more of these out there than are shown here. 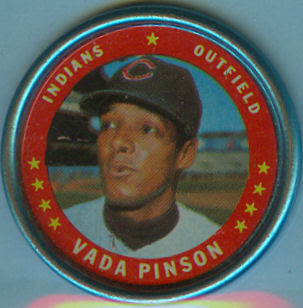 Well, it didn't take long for the second of the three known 1980 Topps coins to turn up. Intrepid readers will know we just discussed these here but I like to keep things moving if there's something new to share. I have to think the Reggie Jackson shown last episode was also bronze. 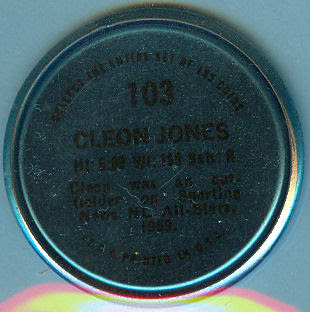 We just need a gold and silver scan plus a Garvey coin to complete the visual reference. No problem, right? 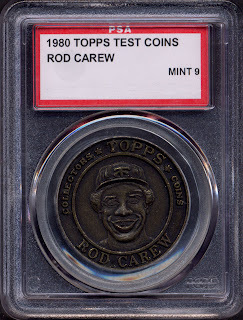 There are occasions where things come through the Main Topps Archive Research Complex that require some poking and prodding in order to divine their true nature. 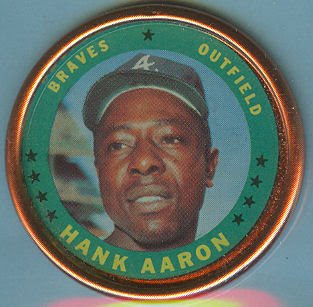 Some are legitimate Topps items, some are red herrings and some still defy repeated attempts to crack the code. All I have is the above scan to go on at this point, the e-mail sending it to me is long dispatched to the dustbin of history. The quality is there and the time frame seems right but the autograph is throwing me a little. I think the jury is out on this item and I would love to see another example or two. 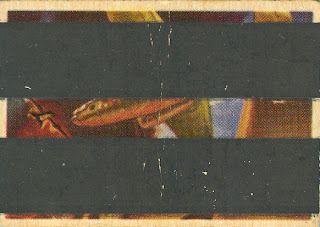 Another mysterious Topps piece is this mini comic book, allegedly distributed as a "box topper" for some 70's set or other and described as a reprint of an earlier, non-Topps publication. I believe this one to be legitimate but cannot verify the distribution method. 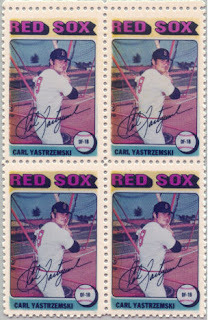 In fact, there is a whole series of these covering a number of different years, all featuring Yaz. 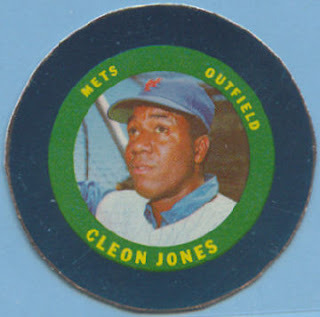 Other Topps fakes include a sealed set of puffy stickers from 1978, bearing odd looking logo styling with a dreadful number of typos and white plastic rings with a small 1955 Topps baseball card affixed. No scans available of those at present but you can imagine what they look like if you close your eyes. 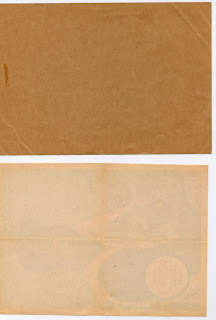 Some mystery pieces may just be typos, such as a two paneled 1968 Topps Action Sticker sheet (3 panels is how this great set was issued) and some may be guesses, such as 1960's ballpoint pens with player likenesses. They could be real but no hard evidence exists to suggest such a thing, just a cast off line in some long ago hobby publication. 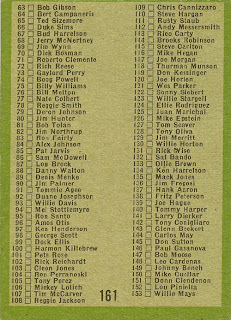 Then we have the catalog error, such as the entry in the 1968 ACC updates described as R-429-68-1, which indicates a series of sixteen 1968 paper baseball posters measuring 11" x 14". Well there is a set of baseball posters that year but they are 24 in number and even larger than the erroneous listing shows (which likely was for a series of O-Pee-Chee football posters). 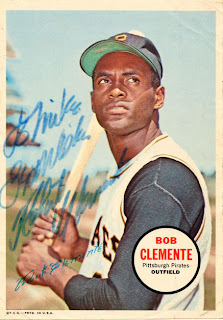 The biggest mystery of all though, is this 1967 Poster Sticker of Roberto Clemente. A lot of advanced collectors believe it is real and it may well be but it may also have been a Cinderella piece, a one-off done up as a lark. 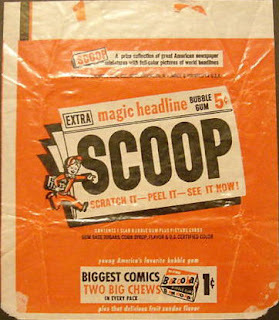 Except for the missing number (11) on front, it looks like a regular '67 insert poster of Ol' "Bob". I do not know if the autograph is legitimate, it would help determine if the sticker is real if it is, in turn, real itself. 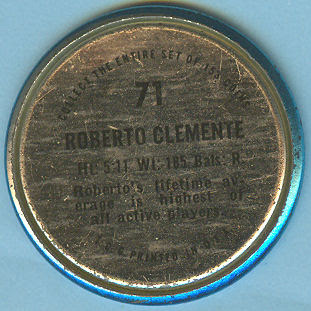 The back looks period, below it is the back of a regular '67 Clemente poster. Handily, this helps determine it is the same size as the issued poster. So many mysteries, so little time! If anyone out there has further details on these issues, please drop me a line. 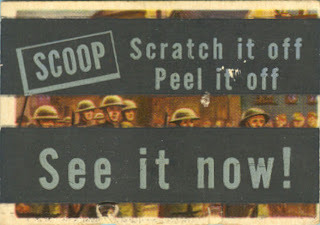 Topps experimented early on with scratch off features on their cards and this early dabbling led to a stellar set of cards issued in two series in 1954 called Scoop (commonly but incorrectly called "Scoops"). 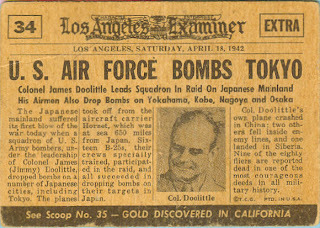 Using a "you are there" type newspaper article on the reverse, purchasers had to rub two thick black bars off the front of the cards to reveal a painted image related to the story on back. 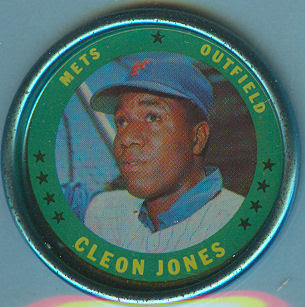 Measuring 2 1/16" x 2 15/16" these little babies were quite colorful and first issued as a 78 card series. They must have sold well because a second series of 78 cards came on the heels of the initial run. With the exception of a few ballplayers and boxers plus a handful of famous historical figures cards can be had quite reasonably these days, with second series cards going for about double those in the first. We are talking single digits for nice examples of the commons, even among the high numbers so this is a great set to collect. There is, however, a big BUT involved. The bars are pretty thick so maybe with a little coaxing they would peel off. So really there are three different versions of these cards but I do not know if all cards can be found in all three styles. I think most collectors who go after a set try for uncoated cards and then try to obtain a sample of each black bar type. I would not recommend rubbing off the bars at this point as they look and feel integral to the cardboard now. There are some boxers in the set as well that command decent but not exorbitant prices while Ruth tops them all (but is still pretty reasonable). 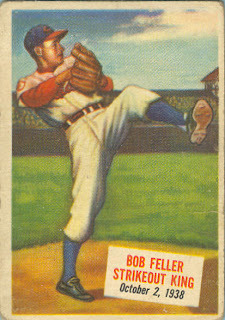 Feller would be my choice for a baseball type (witness the one I own, above) and seems to be more plentiful than some other cards. I don't know why the second series baseball themed cards do not show individual players but it may have been due to some type of licensing squabble. 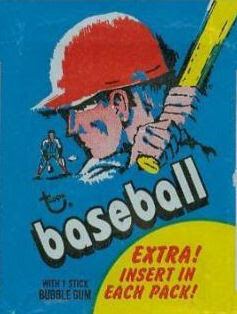 The set was also issued by O-Pee-Chee in Canada, although I cannot state with certainty both series came out up north. This is a good spot to voice my long held opinion that a solid Canadian card guide is sorely needed in the hobby. I can't find a scan of the one cent pack but it would have had a repeating design. If someone out there in Archiveland has one, send it along and I'll include it in an upcoming "catch up" post. The current issue of The Wrapper (#244) has a piece on Sports Cards in Non Sports Sets written by friend o' the archive Bill Christensen that has the scoop on this set among others. Go grab a copy today and tell Les I sent ya!